BusyCal can display the birthdays and anniversaries from the iOS Contacts app in your calendar. With these calendars enabled, a Birthdays calendar and an Anniversaries calendar appear under the Other heading in the Calendar List, and any contacts with birthdays or anniversaries in their Contacts records are displayed as all-day events in the calendar. The Birthdays calendar and Anniversaries calendar are read-only and cannot be edited in BusyCal. If you want to change or remove a birthdate or anniversary, you must make the change in Contacts. 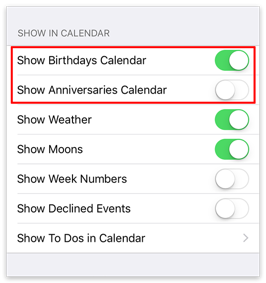 The Birthdays and Anniversaries calendars appear only in BusyCal and do not sync to other services like iCloud and Google; however, the Calendar app in iOS and OS X has a similar option for displaying a Birthdays calendar. BusyCal requires access to the OS X Contacts app for displaying Birthdays and Anniversaries. The first time you open BusyCal you should be presented with an alert asking if you want to grant BusyCal permission to access your Contacts. If you did not grant BusyCal access to Contacts at that time, you must do so manually, by opening the main iOS Settings app, going to Privacy > Contacts, and turning on BusyCal.